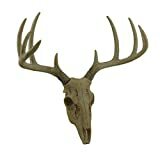 Nothing complements a hunting tale as well as a skull mount. When you harvest record-worthy deer, you MUST keep a trophy. It is a hunter's seal to his bragging rights. That said, how to clean a deer skull can be quite a challenge. If you are up to the challenge, however, this read on. N.B: Some professionals will make a mount out of your deer head for a fee. The fee is usually quite sizable. 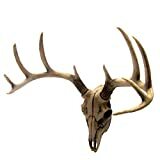 The cheaper option is just to read this guide and learn how to clean deer skull & mount yourself. 2. A boiling pot that can accommodate your deer head. 3. Quick-dry adhesive like super glue. 5. A scalpel or a small sharp knife. 10. Hydrogen Peroxide (preferably 10% - 15%). 11. Enough white gas to drown the skull. Skinning the head is a whole different task if you are looking to create neck or shoulder mounts. That will be handled in another article. This 'how to clean deer skull' guide is specific for European mounts, especially this skinning part. Using a very sharp knife like best camping knife to remove all the skin, eyes, and as much flesh as you can. You do not have to remove everything clean off the bone. That will be handled in the next step. Strip the skull of flesh until the skull bone is almost visible. N.B: An attempt to remove all meat with a knife can damage the skull by scratching it. It may be faster but will lower the overall quality of your final mount. Deer head is easiest to skin just after a hunt. If you are to process it later, skin it before freezing. If that much time is not available, freeze it immediately after a hunt. The skinned head is simmered, not boiled, to remove the remaining flesh. Boiling bones do not have a very pleasant smell. If the Mrs is not too keen on your hunting escapades, boil the skull a safe distance from the house. Mix water and washing soda in the ratio of half-a-cup per gallon of water (0.25 L Washing Soda For Every 7.6 L of Water). Boil the mixture in the pot. Once it is bubbling hot, lower the temperature and bring the liquids to a simmer. You can now immerse the skull in the liquid. Check every 15 minutes and scrape off loose flesh. Use a stiff wire to remove the tissue in the nasal cavity carefully. The soft nasal bones are very delicate and will break if too much force is used. A small nozzle hose is excellent for the process. Teeth will become loose and should be removed, cleaned, and dried in the order of their placement in the jaw. Glue them back in for the whitening step. Finally, you should remove brain tissue from the hollow in the back of the skull. Repeat the processes until you are satisfied that the skull is clean. N.B: The process of how to boil a deer skull does not involve actual boiling. Actual boiling would damage the softer bones of the nasal cavity. If, however, you are not too keen on learning how to boil a deer skull, you can achieve the same results using taxidermist beetles. Rotting is also another way of cleaning a deer skull without boiling. Taxidermist beetles are faster but expensive. Rotting is inexpensive but may take a couple of months. To be sure that all tissue is removed, expose the skull to flies for ten days. Maggots will remove every shred of remaining flesh. The skull should then be simmered in the water/washing soda mixture to remove the maggots and fly eggs. Never boil an un-skinned head. The skin produces oils that yellow the skull lowering the quality of the mount. After boiling, degrease the skull by washing with soap and then soaking it in white gas for 12 hours. After carefully following the boiling deer skull guide, you should be ready for this step. One thing to note, however, is that if the skull is for record purposes, boiling may shrink it. 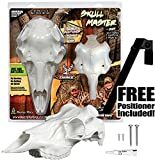 You should hire a professional to create the mount or look into other ways of how to clean a deer skull without boiling. I suggest maceration or using taxidermist beetles. There is no boiling and damage to skull size is zero to minimal. The process of whiten deer skull involves bathing the skull in hydrogen peroxide until the desired level of whiteness is achieved. The skull should also be totally dry. Dry it in the shade before the peroxide bath. Shade-drying keeps the skull from cracking. Be careful to keep the antlers off the peroxide. Over-exposure also damages the bone quality and makes the skull brittle. Remember this while following our how to whiten a deer skull guide. N.B: Even though I have used bleaching and whitening deer skull techniques interchangeably, But the two are very different. NEVER use bleaching agents on the skull. They will damage the skull and overall mount quality. No matter the type of animal, how to bleach a skull is a chemical-intensive process. Use protective wear. Also be careful not to overdo it. This step of how to clean a deer skull determines the final look. Try to keep the look as natural as possible. To mount the skull, screw the skull to a plank. Be careful not to break bones. The mount is also more appealing when the screws are not too visible. Before mounting, I recommend you apply a coat of lacquer to the skull. The skull will look better and last longer. Gloss and Satin finishes are exquisite. Use either depending on room décor. The skull, however, looks tampered with and loses its natural look. Use a matte finish to maintain that natural skull look. Tell us your thoughts on these how to clean a deer skull steps. Be sure to notify us of the results you have with our recommendations in the comment section. If you discover a better way of doing things, we are always eager to learn.